I wait outside a 19th century Heritage-listed cottage-style house. From the back of the quiet and empty house the sounds of construction stomp their way to the front. I press the doorbell – no response. I make my way around the front and see no one. I decide to wait leaning against the cream plaster ledge. 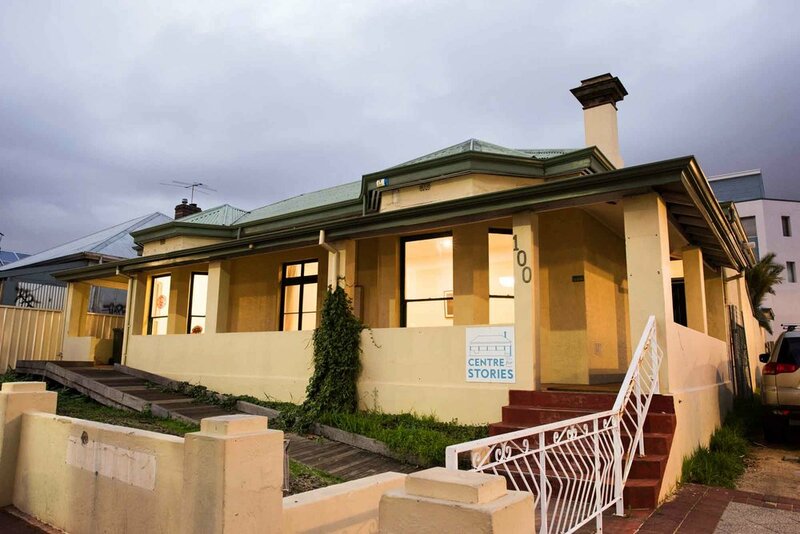 I am to meet with Caroline Wood, the founder and director of Perth’s Centre for Stories, located in 100 Aberdeen Street, on the outskirts of Northbridge’s night life. As I ponder about her she rolls into the street parking in front of the centre, waves from the inside of her car, smiles and as she emerges from the driver’s seat apologises. “Hope you haven’t been waiting for long?” she says. She quickly walks over to the ticket machine. I take note of the child’s seat that takes up most of the backseat of her hatchback, she smiles as she explains her grandson spends every Wednesday with her. Eventually we make our way into the centre, she organises what she has brought with her and gives her computer a glance. As she finishes we plan to get coffee – which once we order she insists on paying for – regardless of my hesitancy. Originally from Singapore, having dropped out of high school in year 10 she decided to go to London and following the flow of life ended up doing a Bachelor of Art History and Science, majoring in Psychology. As someone who was always inclined to the arts it should come as no surprise that Caroline founded the centre, which although from the outside looks like a literary focused centre for deep thinking, is at its core a place that empowers those who drop by, by teaching them the power of storytelling. The Centre for Stories is the brain child of someone who was embedded in social justice and the political discourse for quite some time. As the State President and member of the National Board of Amnesty, Caroline recognised the high calibre of people who surrounded her but was not satisfied with its bureaucratic practice. Pragmatism is her venture’s driving force. “I’m much more a doer than a pontificator” she states with a giggle, as she explains that activism was her priority; not the PhD which she felt obliged to start by her colleagues. So what makes her an active citizen if it isn’t already evident? Active citizenship by her terms is someone who is involved in their community, and particularly in her case, someone who is willing to give the disenfranchised confidence. “All citizens have a responsibility to others to ensure they are not disempowered or disadvantaged or not treated respectfully. I believe one person can make a difference, one person at a time”. The centre currently has a number of partnerships and programs that run throughout the year. In partnership with the Perth International Arts Festival they have composed the project ‘A mile in my shoes’ with the Empathy Museum which consists of physical shoes with attached stories. The exhibit is currently touring worldwide. The centre also focuses on immigrants: providing support in their English development and integration into Australian society, but also by empowering the new generation of African-Australians by holding competitions for emerging writers and creating paired mentorships with established writers. These are only a few examples of their efforts. For all the energy that Caroline exudes, her enthusiasm, intellect and the network that has been established by the centre, there are still challenges. Caroline and her husband finance the centre, something which she acknowledges as unsustainable. The renovations at the back of the centre will become two apartments and a café space which they plan to lease, as well as office spaces for the centre to make more of the front house available for venue hire – from this they expect to create some income for their small team and pay off the mortgage on the property. Events which they run and hold incur a small fee (while still being accessible to a wide demographic) to provide some additional financial support, but it is partnerships which provide the solid income. The financial situation is perpetuated by the current social environment. There are limited grants available for the type of initiatives the centre runs. The Centre for Stories categorises itself as a community and arts centre. As of 2017 the Department of Local Government and Communities stated it would only be investing $9.4 million across the state and the Department of Communities granting $29 million in a three year period. Further budget cuts to the Department of Culture and the Arts (DCA) since 2015 (the year the centre opened) have made it harder for literary based centres to receive grants, with only two organisations successfully achieving a grant, both of which were publishing houses. The DCA did increase its funding by 25.9% between 2011-2016, but only $1.17 million were dedicated for funding literature. It is necessary for people to actively search for the centre or the events they run to become aware of what is happening, there is an underground intellectual community in the city of Perth which is not in the main stream of what people are aware of. Despite the fact that her typical day is akin to something we only see super-humans do in movies; from the 5am-wake-ups to the over-8-hour-work-days, exclusive of the home cooking, exercise and leisure reading, whilst balancing time with the grandkids and the Margaret River press. Caroline still manages to take time to enjoy the efforts of the centre, deciding to focus on the way it empowers others through literature and the skills of storytelling – becoming much more than a centre with a literary focus. The centre allows individuals to take the time to educate themselves in an environment that doesn’t have much room for deeply thought out conversations, particularly as we become more polarised in our politics. 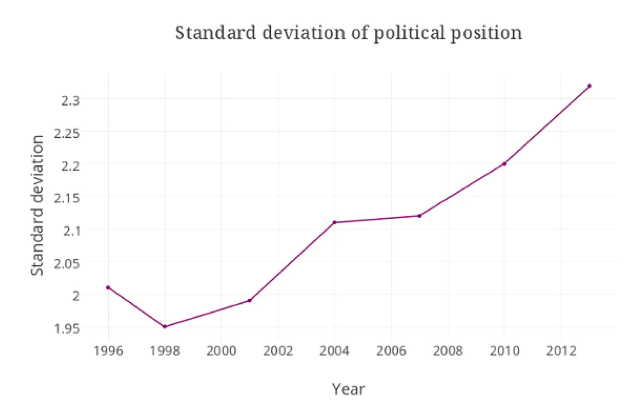 As per Australian voters using the Australian Electoral Study survey (AES); curtesy of The Guardian ‘Australian politics becoming more polarised’ (2014). According to Priya Basil, a British author and political activist who co-founded Authors for Peace, we need to take on the task of educating ourselves. Priya was featured by the Centre for Stories in a “With Us or Against Us” segment titled “Art, activism and the culture wars” in partnership with PEN Perth. The night focused on the importance of being politically and socially aware in order to ensure that our communities have a discourse that reflects reality and have educated discussions on current affair issues. “There is a role to writing and the citizen when it comes to polarising issues. “but the narratives are not just made with words, they are made with actions.” Priya said. The words of this highly regarded author of realisms brings forth an example of the conversation that the Centre for Stories endorse. They aim to empower individuals to think analytically by employing the mediums of literature, enabling them to impact upon the current discourse of society and consequently their own story. Ultimately bringing the art of literature to its forgotten status as a means for exhibiting the finesse and cerebral capacity of the society it encompasses. To listen to more conversations from the Centre for Stories click here. For information about future events click here. Images curtesy of the Centre for Stories.